LEGO Fan and Flickr.com member Arthur Gugick a.k.a. torgugick has created amazing mosaics using only official printed 1x2 tile pieces with decos like control panels, computers, arrow signs, literally every kind of printed motives. 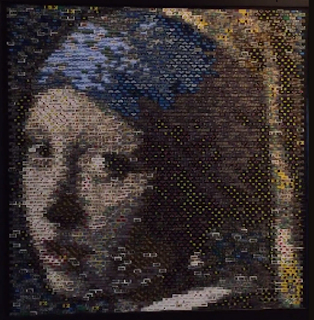 He created the famous painting "Girl with the Pearl Earring" and the movie poster of the cult film "Silence of the Lambs" You probably seen many mosaics built with bricks, plates or tiles before but these are really unique. Check out the videos where the camera zoom out beginning from the singular tile pieces and expands to cover the whole picture. Custom Space Faction Contest - Winners!